Cooking a turkey for Thanksgiving is something everyone should be responsible for at least once in their life. Talk to several different cooks and they all have their own method of cooking a turkey including smoking, frying, baking, and spatchcock. At the end of the day, you want to serve a turkey that is moist, delicious and looks beautiful. This recipe will walk you through roasting a turkey for Thanksgiving on a Big Green Egg. This is not about smoking a turkey, though this does have a hint of smoke flavor. Now sit back, grab a nice glass of Beaujolais nouveau, and enjoy this post for Big Green Egg Thanksgiving Turkey. Get yourself started with a fresh turkey, Lane’s Signature Brine, and your favorite BBQ rub (I used Dizzy Pig’s Mad Max rub). Making the brine couldn’t be easier than with Ryan Lane’s new product. The Apple Cider Vinegar gives this brine the perfect flavor profile for the turkey. Just mix 3 cups with 2.5 gallons of water and you are good to go. Place the turkey in the brine, cover, and refrigerate overnight (12-24 hours). After 24 hours remove the brined turkey from the bucket and rinse well ensuring all the salt is removed. Pat the brined turkey dry with paper towels and place back in the fridge for another 24 hours. This will dry the bird’s skin helping you to achieve that crispiness everyone loves. After 24 hours remove the bird from the fridge while you set up the Big Green Egg. To ensure the breasts cook at the same time as the thighs/legs place a Ziploc bag full of ice on top of the turkey breasts (trust me on this). Set up your Big Green Egg for indirect cooking using a ConvEGGerator . 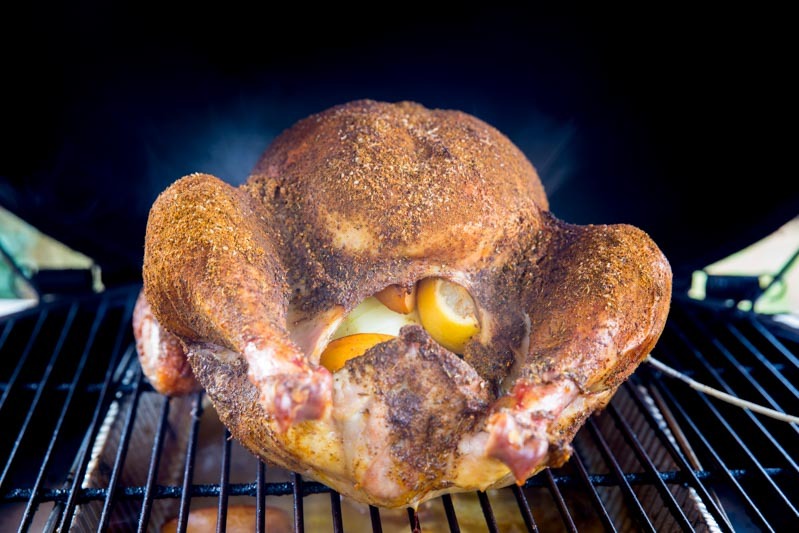 Place several chunks of hickory wood in with the charcoal to give your bird a hint of smoke. Pick your favorite BBQ rub for the turkey to add some extra flavor to the skin. Mad Max from Dizzy Pig is a great choice as the flavor profile is built just for turkey with garlic, salt, sugar, and lemon peel. Rub the outside of your bird with olive oil or with softened butter and then apply the rub. Use a drip pan on top of the ConvEGGerator filled halfway with chicken stock, white wine, and some aromatics. This will catch all the drippings from the turkey as it cooks and can be used later for the gravy. Once the Big Green Egg is up to 325° and is stabilized it is time to place the bird inside. Set the turkey on the grilling grate above the drip pan sitting on top of the ConvEGGerator. You want the bird to measurer 165° in the breast and thigh using a digital thermometer. Check the turkey every hour to measure the temp and baste it with the drippings. This 14-pound bird took 2.5 hours until it was ready. Once it measures 165° pull the turkey off the Big Green Egg and place on a carving board. Let the turkey rest for 10 minutes before slicing and serving. Looking for the best way to cook your turkey this Thanksgiving on a Big Green Egg? Well look no further as this recipe for Big Green Egg Thanksgiving Turkey will be all you need.